IsoGel Air isolates the 3 key contributors of skin breakdown; pressure, shear and microclimate imbalance. The IsoGel Air LAL system delivers direct air to skin in the sacral region and continues air flow to the torso.3 Our exclusive Equilibrium cover by Dartex® equalizes pressure redistribution while balancing the Micro-climate of the skin through its highly breathable yet durable fabric.3 The combination of the cover and Open Gel column design, allows air to flow freely throughout the surface without obstruction. The IsoGel Air LAL system has multiple outlets for direct air to skin in the sacral region and continues air flow to the torso. Product features are graphically shown on the top and the side of the cover for training and identification purposes. 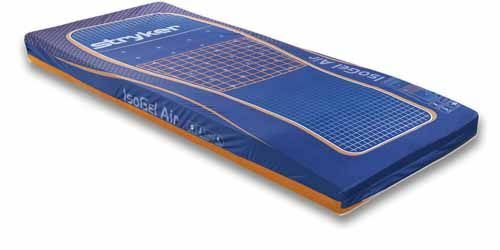 Stryker Medical’s IsoGel Air product is designed for an expected service life as listed below under normal use, conditions, and with appropriate periodic maintenance as described in the maintenance manual for each device.